Today's mission is to create an evening routine for yourself, as well as for other members of your household. 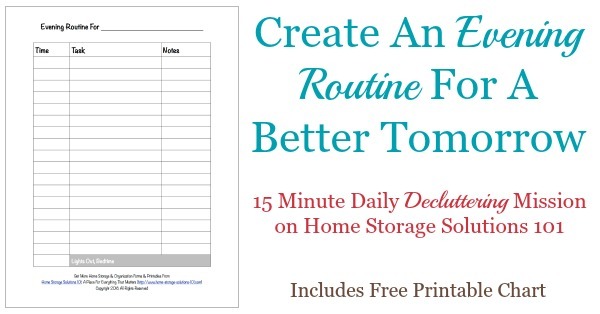 To help you with this task I've created a free printable chart that you can fill out, plus provided a list of ideas and suggestions for tasks you could include in these routines. This mission is designed to be done while we work on the Create A Morning & Evening Routine Challenge here on the site, which is part of the 52 Week Organized Home Challenge. Having a set routine for what you do in the evening can be especially helpful because by the end of the day you're tired. Therefore, getting into the habit of doing certain tasks regularly and habitually it makes it easier to streamline and not have to think about each task as hard, but instead to just get it done. When you're focused on making an evening routine ideally you want this list of tasks and activities to do the following things for you: (1) allow you to finish up tasks you started earlier in the day around your home so they're complete; (2) get a jump start on the next day by preparing some ahead of time, making your mornings, and really your whole day tomorrow run smoother in the process; and (3) get yourself relaxed and ready for bed at a decent hour so you can be rested enough for the next day. What that means, in practice, is that you will likely have two phases of your evening routine. The first will focus on tasks for yourself and your household, finishing up chores or getting things ready for tomorrow. The next phase is something some people call a before bedtime routine, but that I personally have grouped as part of your evening routine. That before bed part of the routine is where you get personal care tasks done, plus relax and get yourself ready for a good night's sleep. You really do need a bit of time between getting tasks done for the next day and closing your eyes for lights out, just so you're relaxed enough for sleep. It is up to you to decide what you will include in your evening routine, so although below I've made some suggestions and provided ideas, you should not take them as mandatory. 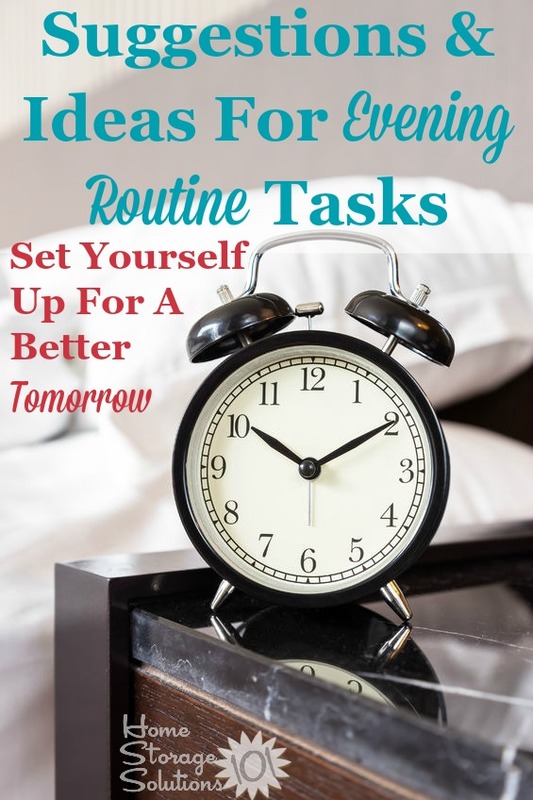 Only fit in as many tasks as you can reasonably get done and still get to bed at a decent hour, and so you don't feel overwhelmed or discouraged when you don't get them all done. 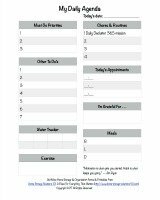 When working on your evening routine, also consider what you put in your morning routine chart from yesterday's mission. These two sets of tasks should complement one another to make sure, over the course of the day, all the things you feel are priorities are getting accomplished. Below is a free printable I've created that you can use for this mission, if you'd like. To get this printable either click on the image of the printable or on the link below it which says "click here for your free printable" and it will open for you into a new window as a PDF. Getting enough sleep is vital to your good health, but it is also important for getting and keeping your home organized and running smoothly. So when you're filling out this chart I suggest the first question to ask yourself is when do you want to get to bed, to make sure you get enough rest? Once you've decided on a reasonable bedtime I suggest filling out the form backwards, meaning start with your bedtime, then fill out how much time you want to relax and unwind without doing tasks before that bedtime, and then list the times for each task in your evening routine in reverse chronological order. 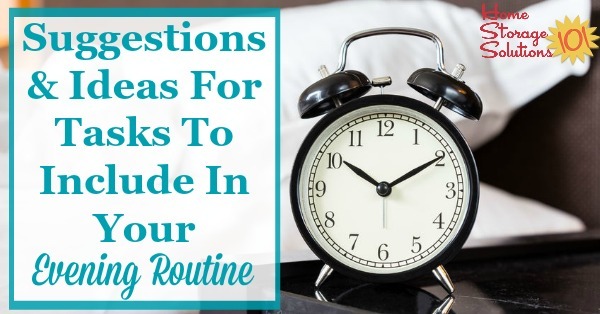 This will help you figure out what time you'll need to start this routine to actually get everything done and still get your rest. 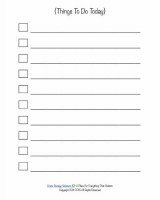 Filling out the form in reverse will also help you see if you have too much planned for your evening routine. You need to be realistic about what you can accomplish after a long day! 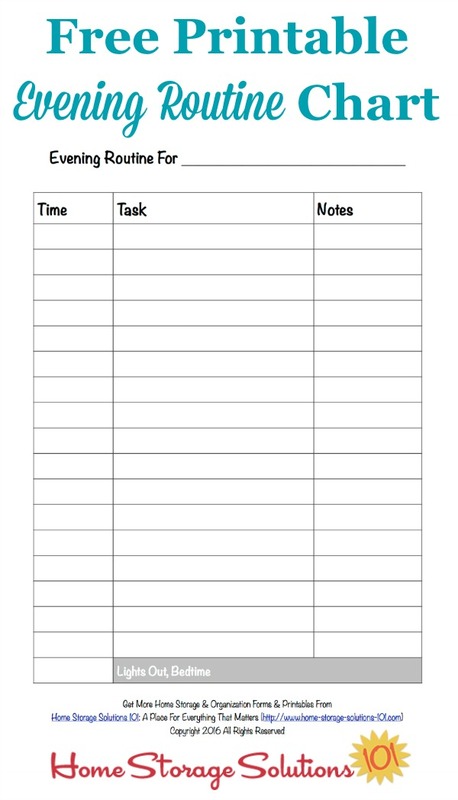 When you're first trying to get in the habit of doing your evening routine you may find it easiest to have this printed out, and placed in a page protector sheet. Then, you can use a dry erase marker to check off each item as you do it until it becomes second nature. 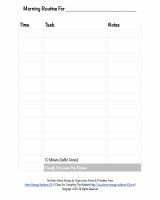 Once you've gotten used to the routine it can still be helpful to place the routine chart in a visible location to help remind you of what tasks need to get accomplished and to keep you on track as needed. Do you want more help, or to dive more deeply into the topic of developing an evening routine? If so, then I recommend the course below from my friend Crystal Paine, from Money Saving Mom. 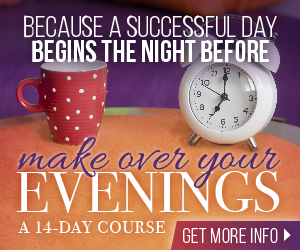 Find out how to set up a realistic, workable, and life-impacting evening routine in this 14-day course. It costs $17, and you can find out more about it at the link.